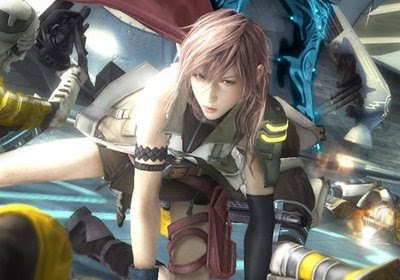 NextGen Player - Canada's Premier Entertainment Blog: Will FFXIII Release in Japan for Xbox 360? It's another lazy Saturday which means time again for another edition of Mind Games, a feature where we ask you our loyal readers questions that are slowly eating us up on the inside. For this week, I'd like to reminisce for a bit back to July 14, 2008: that fateful day when Square-Enix President Yoichi Wada took the stage during the Microsoft press conference to anounce Final Fantasy XIII would release on the Xbox 360. Many pundits quickly professed that cataclysmic announcement spelled ruin for the beleaguered PS3 with yet another highly anticipated *exclusive* gone multi-platform. However, buried beneath this megaton announcement was a footnote stating that Final Fantasy XIII would be multi-platform in North America and Europe - Japan conveniently not mentioned. Of course as the story goes, Yoichi confirmed that FFXIII was remaining exclusive to PS3 in their homeland of Japan. Well that was last year, and as we've learned, not many games stay exclusive this generation. With PS3 hardware sales surging in Japan, and the Xbox 360 trailing behind the Wii in a distant third place, the announcement of FFXIII could be just want Microsoft needs to gain more traction in the land of the rising sun. Surely Microsoft wants to see that happen. With that said, I want to hear what you guys and gals think on this subject. IMO it will stay exclusive in Japan, no matter how much Sony say they don't buy exclusivity, they'd be stupid to let this go. Never going to happen. Square is already getting on bad terms with Sony, keeping Japan exclusive was a small sign that they didn't want to completely cut Sony off. That along with Versus, the true title to look forward to (An adult final fantasy, Versus is going to be great). Don't forget, Sony owns a portion of Square. I agree, Sony's sales are gonna sky rocket with the release of FFXlll and Versus; not just in Japan but in the U.S and Europe. I doubt it, Microsoft is already getting a lot from SE Infinite Undiscovery, Star Ocean 4, and the Last Remnant (The silence at GDC at the question of the PS3 version makes me believe the PS3 version is vaporware) were all 360 exclusives, timed exclusives if you believe they are but the sales from all three were not as high as SE would like in both the East and West and the fact that SE has released a lot of 360 exclusives the Japanese fanbase who only bought a PS3 need something to "forgive" SE. By making FFXIII exclusive to the PS3 in Japan they show the PS fanbase in Japan that they are still respected to make this multiplatform. Also Everyone knows that FF sells more in Japan overall they're trying to make sure the sales are high for the game and since the PS3 is stronger than the 360 in Japan it makes sense that they get as much cash they can. Adding it to the 360 might just alienate the some of the Japanese audience remember a lot of Japanese people tend to be Xenophobic. Japan they show the PS fanbase in Japan that they are still (respected to make this multiplatform). Well, going by all of our reader opinions it looks like the majority of people think the game will stay exclusive in Japan (225 votes at the time of writing). It'll be interesting to watch this story unfold, especially given Square-Enix's new found love with Microsoft. If it does end up going multi-platform in Japan I doubt we'll hear that announcement at E3. That event is too North American focused.